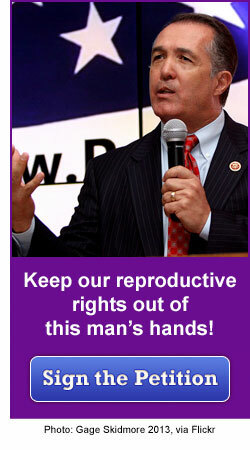 Rep. Trent Franks' (R-Ariz.) nationwide 20-week abortion ban is close to passing in the House of Representatives. He recently reintroduced the D.C. Pain-Capable Unborn Child Protection Act, which would outlaw abortions in the District of Columbia after 20 weeks — in clear violation of Roe v. Wade — and he is amending it so that its provisions will apply across all 50 states. We need your help to stop the 20-week abortion ban from passing! Please add your name to our petition so we can let all members of the House know that we will not let extremists continue to criminalize reproductive rights. The Republican Party and its allies are demonizing the fight for reproductive rights and hijacking the legislative process to limit or even abolish women's access to reproductive health care. But women aren't fooled — and we intend to win this fight. The stakes couldn't be higher: It's a matter of access to vital reproductive health care. The right wing has achieved some alarming and dangerous success at the state level. In North Dakota, for example, Gov. Jack Dalrymple signed into law a "fetal heartbeat" bill that criminalizes abortions after six weeks of pregnancy — the most restrictive such law in the country. Arkansas runs a close second: The Republican-controlled state House and Senate recently overrode a veto by the Democratic governor to pass a ban at 12 weeks. And now Tea Party extremists in the U.S. Congress want in on the act. We cannot let Rep. Trent Franks' 20-week abortion ban succeed. Please sign our petition and stop this unconstitutional legislation from becoming the law of the land. Thanks for all that you do for women and for NOW!